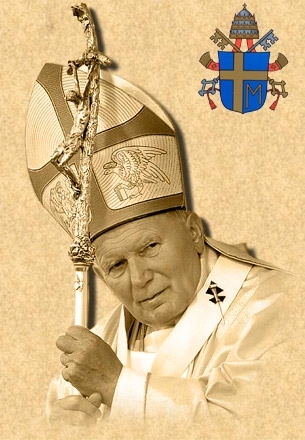 Beloved John Paul II left his physical body on April 2, 2005 after serving the Roman Catholic Church as its Pope, and the world as a beloved shepherd conveying the message of Divine Love, God's Mercy and Eternal Life. 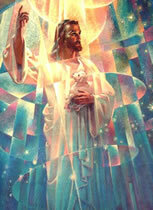 This precious Son of God Ascended on May 1, 2005 and became One with his beloved Mighty I AM Presence. He now has an Immortal Glorified Ascended Body, full of Eternal Youth and Beauty, joining the Ascended Immortal Saints Pope Pius XII and Pope John XXIII. 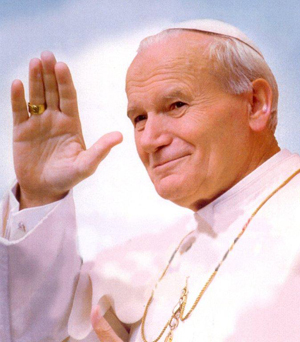 Ascended Master Serapis Bey announced that John Paul II chose May 1 as the day of his Ascension to honor Beloved Saint Germain, and that he has been given the name "John Paul the Great" in the Ascended Master Octave of Heaven. "I, Serapis, stand before you this day to proclaim that within this Earth body has been the release of Light from the Ascension Current of one beloved Son of God who has taken his Ascension. You know well the Lifestream, for much has been reported of the good of his accomplishments – of even in this last embodiment. I speak of the Pope, having been Pope 27 years within that office. 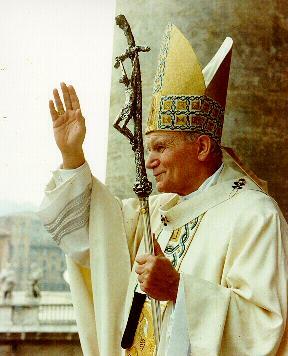 John Paul II has entered into the Oneness of the Eternal Life with his own God Presence. 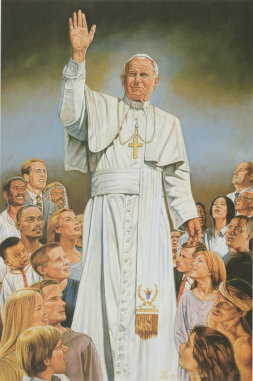 This Life he has elected to move forward known as John Paul the Great, to remind the faithful of the Ascended Masters - that it is not merely what accomplishments you have deemed were important by the outer ego, but those that were important to your own God Presence in the fulfillment of the Divine Plan of your lifestream and the bending of the knee before the Allness of God. 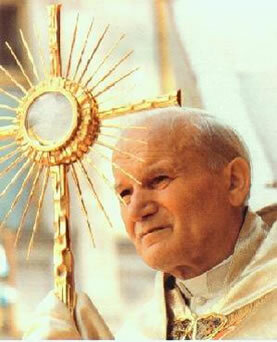 This Son of God set the example for one who was faithful to the Heart of God and to the blessed Mother Mary. 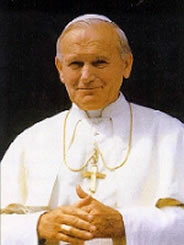 He invoked the Light daily into his countenance so he might have the election of God, not merely because he was the Pope and it was his Divine Office to fulfill, but because he desired the closeness of God, the reverie of God, and ultimately the Oneness that comes forth when you know yourself to be a part of the Divine Family of God. "This Son of God set forth many traditions through his office in this embodiment to remind those of all persuasions and all religious faiths, that God was important to pursue and that the barriers between religious faiths should dissolve, allowing for the fullness of the Truth of the Law to come forth: that every Son and Daughter of God was indeed upon the pathway following the footsteps of the blessed Jesus toward the Ascension. Blessed Hearts, he was fearless. He moved among those in the Earth even when threat against his bodily life was leveled to a point where others would hide beneath the rock. He stood fearless before all. He moved into areas where there was not religious freedom and proclaimed that freedom to all. You, blessed ones, can look to his record as one who stood for God in Life. . . . "
" . . . This Son of God, having passed from the screen of the physical octave previous to this cycle, elected to take his Ascension upon May 1st so that he would honor Saint Germain’s endeavor to bring the Purity of the Teachings to the Earth, so that there would be the bridge in his own Conscious Momentum between that which had been the body of God that he supported and thrust forward to affect change in the Earth under the auspices of Jesus and beloved Mother Mary, into that which is the Domain of Saint Germain for the next 2,000 year cycle. 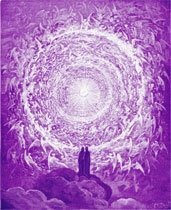 This Honor that he affords to Saint Germain is returned by Saint Germain to his Lifestream, as he stood with myself, El Morya, the Maha Chohan, and all who are Chohans of the Rays of God Consciousness for the Ascension that took place. Blessed ones, this honor you are drawn into, to have the Radiance of the Light released from his Ascension to build a spiraling momentum of acceleration in your own life, so that you might grasp that Oneness of God and the acceleration in your own life to fulfill your Divine Purpose, to transmute your karma, and to be One with the Mighty I AM Presence as you walk this Earth as the Christ. . . . "
" . . . We do not often speak of the Ascension of those who do not have the awareness of many in the Earth. For if it is not their Mission to continue to be called upon by the students of the Ascended Masters or to have their Light invoked, and they have elected to go into the Great Silence for a time, or even for longer - for Eternity, it is our election to only bring to you those who have a Mission with Earth’s Sons and Daughters of God, that desire to continue on their thrust for a purpose to reunite the Body of God into the Oneness of the Ascension and to bring forth the Golden Age. This is one such Son of God. You may call to his Flame. You are called upon to know his Heart and his Vibration, for his devotion to the Mother Flame will give you the key to the entrée into his Heart. I, Serapis, salute his Ascension, and I salute each one who makes a reaffirmation this day of commitment to their own Ascension and the Purity of the Law. Be sealed in the Light of the Mother Flame, of Purity’s Ray, and protected by Purity’s Holy Angels and the Seraphic Host. . . . "
Discourse: "Do Not Settle for Anything Less Than Your Presence"
Dictation: Beloved Serapis Bey: "The Example of Pope John Paul II's Ascension"
Your challenge is to remain tethered to your God Presence while finding your way through the mental and emotional human creation enveloping this planet. It is one thing to have the temporary connection to your Presence during Conferences. But on the path of Mastery, you must learn to sustain this Attunement as a new life and a new world for yourself for the balance of your incarnation. If you will not settle for anything less than the fullness of your Presence and its limitless Glory, then your human ego will not fall prey to and be sustained by the flattery which causes you to be in duality. You will not need a guru outside your Presence, and you will not be taken in by false imposters of the Ascended Masters. Serapis Bey comes to salute the Ascension of Pope John Paul II, now the Ascended Master John Paul the Great, and to instruct you on the discerning of spirits. Stating that you are called upon to know the Heart and Vibration of this new Ascended Master, Serapis explains what is needed for the Ascension using John Paul II's life as an example. Serapis reminds you to give the Violet Flame and to enter into your daily devotions, for when there is a departure from your Heart, you lose your way and do not know how to discern masquerading entities. This is why the Ascended Masters send forth these Anointed Messengers  so that there will be the touchstone in the Earth of the Masters' Vibration and the record of their Voice in the Earth. Dictation: Beloved John Paul the Great: "Reaching Intimacy with the Heart of God"
John Paul the Great delivers his first Dictation since his Ascension on May 1, 2005. In this Palm Sunday Address, he instructs on the discipline of entering into communion with the Heart of God, and how to reach that state of intimacy with God's Heart. He teaches that forging your Christhood requires an intimacy with your own Holy Christ Self. When you enter into the intimacy of the Love of Christ, you understand what it means to be so consumed with Love that all about you takes on a new vibration. When the Consciousness of the Mind of God moves through you, the Heart, by design, overwhelms all other states of vibration. Then you move through life in Divine Grace, making those decisions that keep you in Righteousness according to your Presence. Presidents, prime ministers and kings joined pilgrims and prelates in St. Peter's Square on Friday to bid an emotional farewell to Pope John Paul II at a funeral service that drew millions to Rome for the largest gathering of the powerful and the humble in modern times. Applause rang out in the wind-whipped square as John Paul's plain cypress coffin, adorned with a cross and an "M" for the Virgin Mary, was brought out from St. Peter's Basilica and placed on a carpet in front of the altar. The book of the Gospel was placed on the coffin and the wind lifted the pages. After the Mass ended, bells tolled and 12 pallbearers with white gloves, white ties and tails presented the coffin to the crowd one last time, and then carried it on their shoulders back inside the basilica for burial - again to sustained applause from the hundreds of thousands in the square, including dignitaries from more than 80 countries. Chants of "Santo! Santo!" 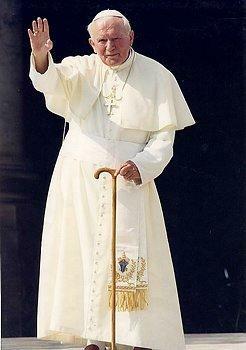 - urging John Paul to be elevated to sainthood immediately - echoed in the square. The first non-Italian pope in 455 years was buried at 2:20 p.m. (8:20 a.m. EDT) in the grotto under the basilica, the Vatican said. 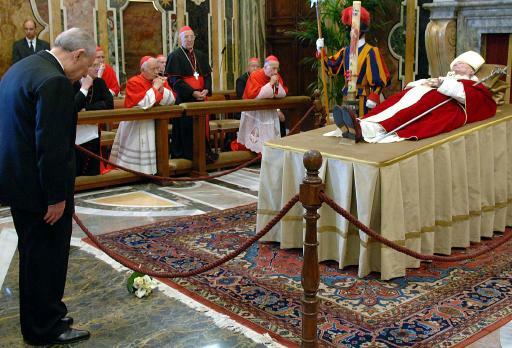 John Paul requested in his last will and testament to be interred "in the bare earth," and he was laid to rest among the pontiffs from centuries past near the tomb traditionally believed to be of the apostle Peter, the first pope. His tomb will be covered with a flat stone bearing his name and the dates of his birth and death. Pilgrims will eventually be able to visit. The 2 1/2-hour Mass began with the Vatican's Sistine Choir singing the Gregorian chant, "Grant Him Eternal Rest, O Lord." Cardinals wearing white miters walked onto the square, their red vestments blowing in the breeze. Cardinal Joseph Ratzinger, later inaugurated as the new Pope Benedict XVI, presided at the Mass and referred to him as our "late beloved pope" in a homily that traced the pontiff's life from his days as a factory worker in Nazi-occupied Poland to his final days as the head of the world's 1 billion Catholics. 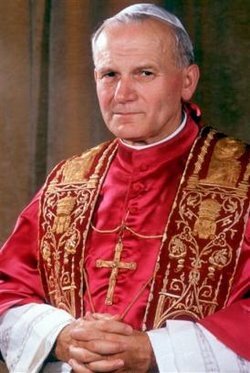 Interrupted by applause at least 10 times, the usually unflappable German-born Ratzinger choked up as he recalled one of John Paul's last public appearances - when he blessed the faithful from his studio window on Easter. "We can be sure that our beloved pope is standing today at the window of the father's house, that he sees us and blesses us," he said to applause, even among the prelates, as he pointed up to the third-floor window above the square. "Today we bury his remains in the earth as a seed of Immortality - our hearts are full of sadness, yet at the same time of joyful hope and profound gratitude," Ratzinger said in heavily accented Italian. 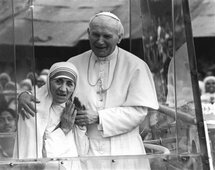 He said John Paul was a "priest to the last" and said he had offered his life for God and his flock "especially amid the sufferings of his final months." Ratzinger was interrupted again toward the end of the Mass by several minutes of cheers, rhythmic applause and shouts of "Giovanni Paolo Santo" or "Saint John Paul," from the crowd. The eruption of cheers came right before the Litany of Saints chant, in which the names of the saints are read. 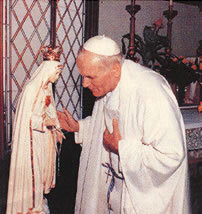 Pope John Paul the Great was a name suggested by many for Karol Józef Wojtyła. Through all its long history, the Catholic Church has conferred the posthumous title of "Great" on just two popes: Leo I and Gregory I, both of whom reigned in the first thousand years of Christianity. 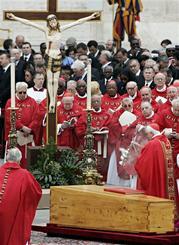 "Papal Legacy: Will history use name John Paul the Great?" by David O'Reilly, Knight Ridder Newspapers April 4, 2005 Copyright © 2005 Detroit Free Press Inc.
Dictations from Ascended Masters, Cosmic Beings, & Archangels.